Clothing Machinery 2018, held concurrently with Fabric Istanbul, will take place from 20-23 September 2018 at the Tüyap İstanbul Fair and Congress Center, Istanbul, Turkey. Organised by Tüyap Trade Fairs Inc., the exhibition covers a wide range of clothing machinery, from clothing sewing machines, spreading and cutting machines, ironing machines and presses, embroidery machines and design printing systems, to sewing and embroidery yarns, steam generator and boilers, folding and packing machines and quilting machines. 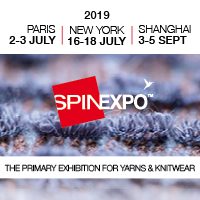 Visitors include clothing, underwear, home textile product and quilting manufacturers, as well as embroidery industry buyers, clothing machinery buyers and sellers, seat and sofa manufacturers, and more. In 2016, the show welcomed 426 exhibitors and co-exhibitors from 29 countries, attracting 36,870 visitors from 73 countries. According to organisers, the number of international visitors increased by 39% in the last two editions and reached 2,813.